Spider Web And Dangling Spider Ring. A large spiders web, dagger ring featuring a dangling spider in silver tone metal. An unusual, large spiders web and dagger ring. The ring design is of a spiders web, with a centrally positioned dagger, and a spider on a chain that hangs down from the main body of the ring. As the spider is set on a chain it moves around the hand with the body's movements. The ring is formed from a silver tone metal. An unusual gothic modern ring. Spider web, with inset dagger and spider on chain design. Giant Rhinestone Studded Spider Brooch. 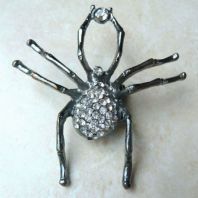 Huge, statement size, rhinestone studded, arachnid brooch, can also be worn as a pendant.